I like to create paintings, which evoke emotions in the viewers. The conception of my work of art starts with either a subject, or an idea or an inspirational view, grabbing colours or an interesting action of the light in that moment. All these evolve into emotions and feelings leading to my art creation and get expressed in different media and various brushstrokes. I particularly enjoy painting portraits. When creating a portrait, besides portraying likeness, catching the person's feeling and expression is my biggest challenge and accomplishment. In my portrait painting I am not after a photographic representation of the person, but rather showing my impression of the individual and his/her overall physical and emotional gesture. To capture this gesture I am not looking only for the special facial expression, which has tremendous importance in the portrait, but also, for overall pose, including the position of the hands and legs. All these gesture elements contribute to the intimate expression of the individual and represent the "soul of that person" in that moment. 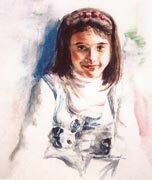 Quite often, in the portraits which I have done, the eyes of the person stare straight at the viewer and his/her gaze follows the onlooker when he/she moves from side to side looking at the painting. This creates the additional emotional connection between the portrayed person and the person looking at the painting. 24" x 36" 40" x 40" 22" x 30"